Seahawks coach Pete Carroll also said he thought the altitude impacted some of the team's players and provided injury updates on a few other players. The first regular season game of the season Sunday afternoon meant the first Pete Carroll radio show on ESPN 710 Seattle on Monday morning. Wright, who missed the Denver game after having arthroscopic knee surgery two weeks ago, Carroll said, “it would be a miraculous return if he makes it back this week.’’ Carroll, though, said Wright was scheduled to run on Monday for the first time since the surgery. 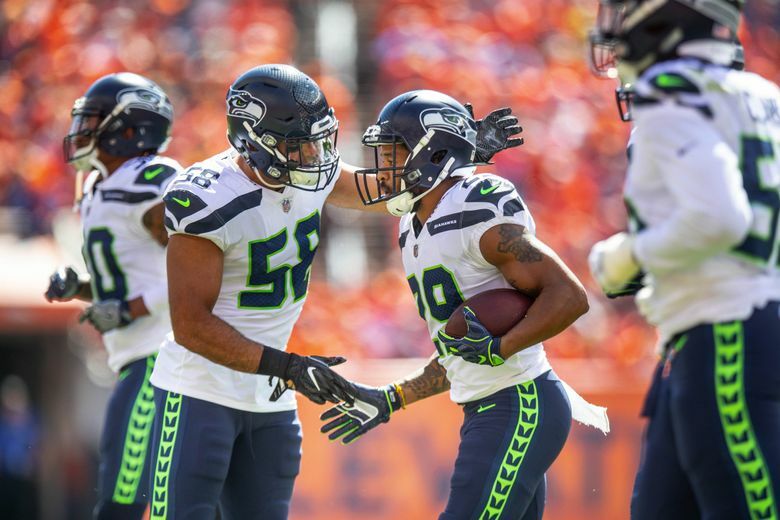 Wright was replaced initially by Shaquem Griffin on Sunday but the Seahawks began using Austin Calitro on base downs at weakside linebacker in the second quarter, and then continued with that approach throughout the game with Griffin coming in on passing downs. Seattle could continue with that look Monday at Chicago. Meanwhile, right guard D.J. Fluker remains out with a hamstring injury suffered in the third preseason game at Minnesota. Carroll’s take on his situation: “We’ve got to make sure we don’t take it too far, too fast.’’ J.R. Sweezy played in place of Fluker Sunday and Carroll noted the team is in good shape with that situation. Carroll also said defensive end Dion Jordan — who didn’t return to practice until last week and was limited to 15 snaps against Denver — made it through the game with no setbacks and should be able to see more action going forward. Jordan missed training camp with a stress reaction in his leg. On what has become the topic of the day — the play of Russell Wilson — Carroll said what you would probably expect, that he thinks Wilson needed to play better in spots but that the team around him also needed to help him more at times. “Russ needed to do better than he did yesterday but we needed to help him a lot,’’ Carroll said of Wilson, who was sacked six times. Right tackle Germain Ifedi had what Carroll called a tough matchup with Von Miller. But Carroll said he thought Ifedi played okay. “For the most part he held up pretty good,’’ Carroll said. In the run game, “we didn’t do enough,” Carroll said. Despite this being Brian Schottenheimer’s first game as Seahawks offensive coordinator and the team’s much-publicized goal of reviving the rushing attack, Seattle actually ran it less than at any time in the 2017 season with just 16 attempts. But Carroll said the main reason for that was going just 2-of-12 on third downs and not keeping drives alive. The Seahawks’ 64 rushing yards was fewer than in all but two games last season and if you include Wilson’s sacks, the Seahawks had 39 passing plays to just 16 runs. According to TeamRankings.com Seattle’s pass percentage of 70.91 is the fourth-highest so far in the NFL. The passing plays included the first two plays of the game, a sack and an incompletion. Carroll said the Seahawks had a couple of plays they wanted to try there and hinted that Denver showed a different look than expected on the first one. But Carroll said reviving the running game remains a priority. Teams always downplay the potential impact of the elements ahead of time, and teams also are limited in what they can do to deal with something like altitude — they think it’s not practical to pick up their entire operation and move it somewhere for 3-4 days ahead of time for a regular season game. But Carroll said Denver’s 5,280-feet elevation did take its toll and that there were a few players vomiting and a few others who had to take IVs. “I thought we handled it but every guy would tell you it was hard,’’ Carroll said. Carroll said accounting for the elevation is why there was some added rotation at some positions and he specifically cited, when asked about it, the tailback spot where Chris Carson and Rashaad Penny each played 25 of the team’s 57 offensive snaps. The Seahawks arrived in Denver Saturday afternoon, keeping to what is their typical schedule for games in the Pacific or Mountain time zones. The Seahawks typically leave two days prior for games in the Central or Eastern time zones.